Marks, Patterns and Wares by U.S. Glass Co.
Rather than being just one entity, this glass conglomerate was formed in 1891 when at least 18 different glass companies were combined under the United States Glass Co. umbrella, according to Colored Glassware of the Depression Era Book 2 by Hazel Marie Weatherman. While it seemed like a good idea at the time, having factories in Ohio, Indiana, West Virginia, and Pennsylvania proved to be a troublesome management proposition back at a time when communication was much more challenging than simply picking up a telephone or sending an email. Two new factories were built by U.S. Glass Co. in the late 1800s. These were located in Gas City, Indiana, and Tiffin, Ohio. The Indiana facility produced “machine-made” or pressed glass including kitchenware through the 1930s. The Tiffin plant made “blown stemware, delicately pressed dinnerware lines with light cutting or etching," or simply plain glass in crystal and a bevy of popular colors, according to Weatherman. Other factories made a variety of glass styles and types including carnival glass, stretch glass, amberina, and others. Over time the various factories were shut down due to strikes, Depression-era economics, and even fires. Eventually, all U.S. Glass Co. operations were transferred to the Tiffin facility. “By 1940, all glassware made was marked with a Tiffin label. By 1951 Tiffin was the only plant still in operation, however, the official name of the company remained the United States Glass Company through 1962,” states GlassLoversGlassDatabase.com and corroborated by Weatherman. This conglomerate marked its glassware in a number of different ways in the early 1900s. One mark combines the letters U, S, and G with Co. in an intertwined fashion. Other pieces were marked with U imposed over an S, or simply USG, according to the Glass Lovers Glass Database marks gallery. The ARTCUT mark was used on pressed glass made to emulate cut glass in the early 1900s. After 1940, all glassware made by U.S. Glass Co. was marked with a Tiffin label. Because a number of factories were producing different types of glass under the U.S. Glass umbrella, the company’s wares don’t have a single identifiable category. They made patterns of lower quality Depression glass, fine elegant glass (primarily what collectors identify as Tiffin), and even carnival glass along with miscellaneous items that don't really have a defined pattern. Many of the patterns made by this company appear in popular books including the now out of print Collectors Encyclopedia of Depression Glass by Gene and Cathy Florence, and Elegant Glassware of the Depression Era by Gene Florence. Some of the carnival glass patterns are listed in the Field Guide to Carnival Glass Patterns distributed by the Heart of America Carnival Glass Association. Patterns include: Athenia (carnival), Aunt Polly (Depression), Cadena (elegant), Cherokee Rose (elegant), Cherryberry (Depression), Classic (elegant), Cosmos and Cane (carnival), Crackle (Depression), Deerwood (elegant), Diamond and Daisy Cut (carnival), Field Thistle (carnival), Flanders (elegant), Floral and Diamond Band (Depression), Flower Garden with Butterflies or Brocade (Depression), Fuchsia (elegant). Headdress (carnival), Jacob’s Ladder (carnival), June Night (elegant), Lois (elegant), Manhattan (carnival), Palm Beach (carnival), Pineapple and Fan (carnival), Primo (Depression), Rising Sun (carnival), Strawberry (Depression), Tiffin’s Twilight (elegant), and Whirling Star (carnival). It’s interesting to note that U.S. Glass Co. was not the only company making a “crackle” pattern in the 1920s and ‘30s. In this instance, L.E. Smith, McKee Glass, MacBeth Evans, Federal Glass, and possibly others, made molded glassware that tried to simulate actual crackle glass (the type that looks broken but made that way intentionally). The look of the crackle glass pattern made by these varied companies is very similar, and folks who collect this type of glass often disregard the maker and focus on the style. U.S. Glass colors in Depression glass include blue (which is more of a medium blue in comparison to traditional cobalt blue Depression glass), clear, green, amber, canary yellow, pink, and black. Not all patterns were made in this full-color spectrum. Tiffin glass is particularly well known for making beautifully colored elegant glass in pink and yellow in addition to clear crystal glassware. Some glass was also made with a satin finish, or even an alternating checked satin pattern known as Echel. This is not a particularly well-known design among today’s collectors but it is a very interesting design. Other Wares by U.S. Glass Co. While glass lovers might be more familiar with U.S. Glass Co. in relation to the Depression glass patterns they made, there were many other wares made by the factories operating as part of this conglomerate. These items ranged from fish bowls to vanity sets to figural lamps shaped like Santa Claus, as shown in vintage advertising dating back to the 1920s as noted in Weatherman’s book. 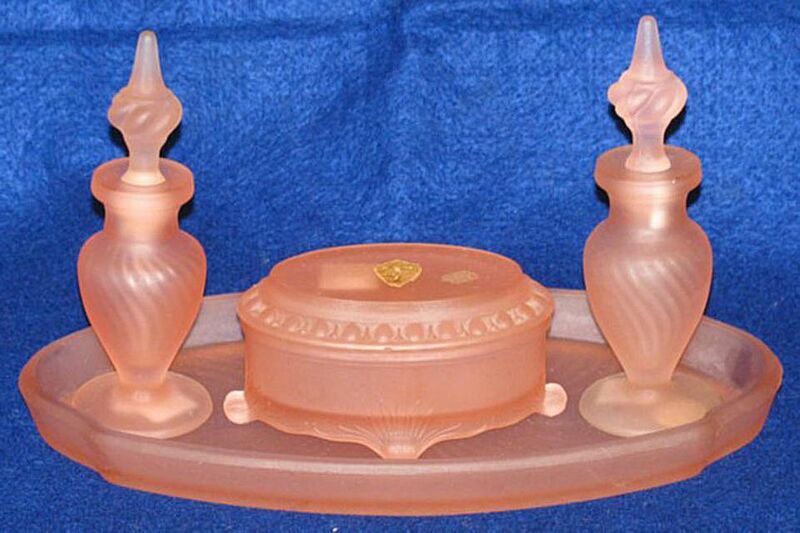 In the 1920s, U.S. Glass advertised “bridge sets” that were basically a coaster/ashtray combination packaged with the company’s footed tumblers. The coaster/ashtray was void of an actual pattern, but the footed tumblers in Primo and their other Depression patterns fit them perfectly. Other bridge sets were advertised in 1927 in an Octagon-shaped pattern (not to be confused with Heisey’s elegant glass pattern actually named Octagon).